Some Impending LibGuides Updates to Warm your January! 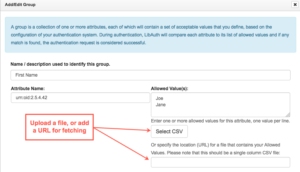 If you use LibAuth groups, you now have a couple of ways to automate the population of the Allowed Values field for your group attributes. 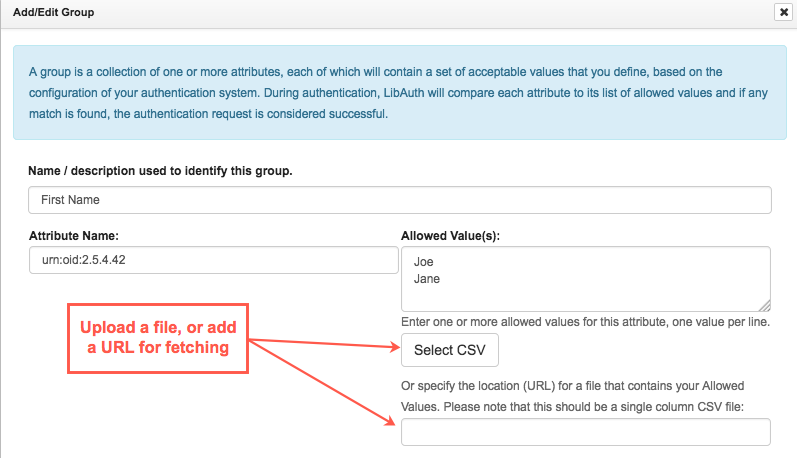 Head over to LibApps > Admin > LibAuth Authentication and click the edit button for your LibAuth configuration. You can either upload a CSV file containing your Allowed Values, or you can specify a URL from which we can fetch the Allowed Values, which we’ll do nightly. What does this feature do for you? You might have a group of rooms in LibCal that are only bookable by current students from a certain college, or by patrons who meet certain requirements. Use this field to let LibAuth know which people are allowed to book. All of the below have been added to Admin > Look & Feel > Language Options > Language Customization. Don’t see one of these for your language? Kindly shoot us an email, and we’ll add it for you. Please include a translated phrase in your language that is as close to the English original as is possible. You can customize it further in your system if desired. Interested in contributing translations for the public side of LibGuides in a language that’s not currently available? We’d love your help! Key 373 is the phrase “Alt. Names/Keywords” that is used for that field in your A-Z Databases list. When you change this key, the changes will be visible on the public and admin side, for consistency. Key 375 is the label “Popular” that appears next to Database assets that you’ve designated as such. Key 387 is the text of the tooltip that appears when you hover over the website/blog icon in a profile box. Key 376 is the word “for” in Database search results. Key 275 is the word “All” that appears at the beginning of the alphabetical browse listing on your A-Z Databases page. Key 123 is the phrase “Last updated” that appears when you hover over a guide’s last updated date on your system homepage. Key 380 is the button text that appears next to the guide sort options on your system homepage guides list. Keys 362 and 365 pertain to the Courses tab on Subject pages and apply only if you have the E-Reserves module. Keys 100, 376, and 322 pertain to information shown on system search results screens in Bento Box format. E-Reserves item modals now correctly display your customized language when you view an individual e-reserves item. We’ve made some small changes to the v1.2 API used for creating and updating database assets. 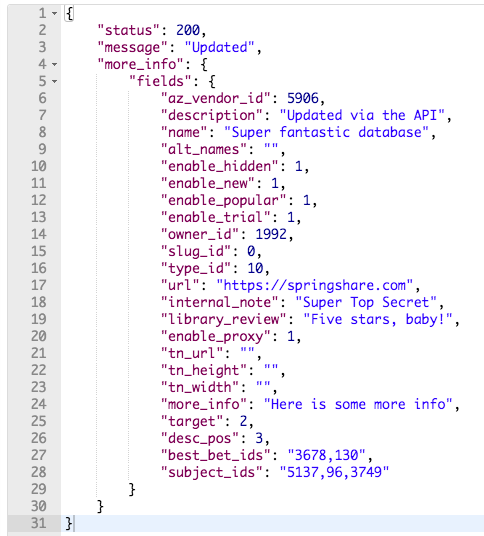 If you’re using these API calls, you’ll now be warned if it contains errors. If your API call is successful, we’ll let you know which fields were updated. For more information, please see the documentation for each API call in LibGuides > Tools > API > v1.2. Here is a sample successful call showing all the fields that were updated. Please note that GET requests for A-Z assets were not changed. When you have item search turned on, “Documents” becomes the default tab. When you do a search but then click to another section of E-Reserves, your search terms are cleared, and you are presented with the entire list of available items. In E-Reserves > Settings, you can specify whether the proxy setting is on when creating new items. When adding a new E-Reserves item, required fields are marked with a red asterisk. Email notifications sent to subscribers of your blogs will contain the blog name in the subject line. We replaced the orange “loading dots” with ones that move at an accessible refresh rate. If your custom SSL certificate is expiring in under 60 days, we will email you. We will email you again 7 days before it expires, if you have not renewed it. Please note that this email is sent to the person who uploaded the certificate files. Sites with guide titles using CJK characters display correctly when displayed in an LMS via the LTI tool. Regular-level users can edit database assets that they own. You can add a book to a blog post by just pasting its ISBN into the Add Book dialog. When you check “Show entire post” for a blog widget, the “Show Images” checkbox works properly. 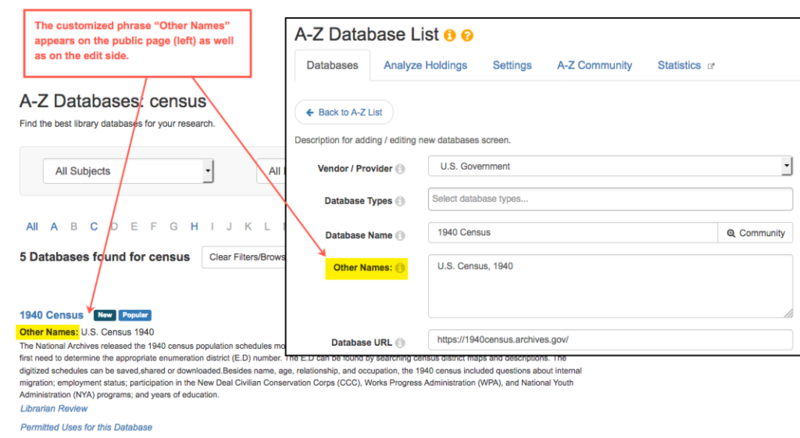 When you add a Database asset to a guide, the Description Display preference is preserved, unless you choose a different option. When you go to a specific page in our support site and log in, you’re taken to the proper page instead of the support site home page. We optimized the query behind the LTI Instances page; it’s super, super fast! We fixed the “Filter by Owner” menu on the A-Z list so that it includes everyone. The number of profiles listed on the profiles page matches the number of profiles displayed. The code was not out yesterday when you checked, but it’s gone out to all three regions, as of about 8:00 a.m. Eastern today.